The final day of the month was the coldest of the year so far with a brisk south-easterly wind blowing all day. A single Greenland White-fronted Goose was a new arrival accompanying 62 European White-fronted Geese in the middle of the Island, and a count of 1315 Greylag Geese was made. A 2nd winter Iceland Gull was near the Lighthouse and at least one 2nd winter Glaucous Gull was seen. Some wildfowl numbers increased with 9 Pintails and 23 Shovelers the most notable, while the 5 Whooper Swans remained and there were now 8 Mute Swans present. Singles of Peregrine and Merlin were around Twingness and 17 Twite were still in the Observatory crop. A Black-throated Diver on the sea off Torness in the afternoon was an unexpected highlight today. Also off the more sheltered west coast were 4 Red-throated Divers, 2 Great Northern Divers and 242 Eiders, easily the highest count of the year so far. A drake Common Scoter also flew north past Torness and 4 Woodcocks flushed from the boulder scree suggested there had been a little cold weather movement. 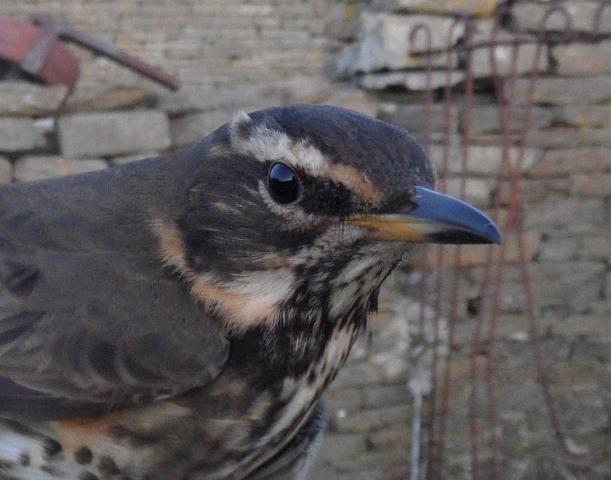 Other indicators were 4 Redwings newly arrived at the Observatory and a Song Thrush at West Beach. 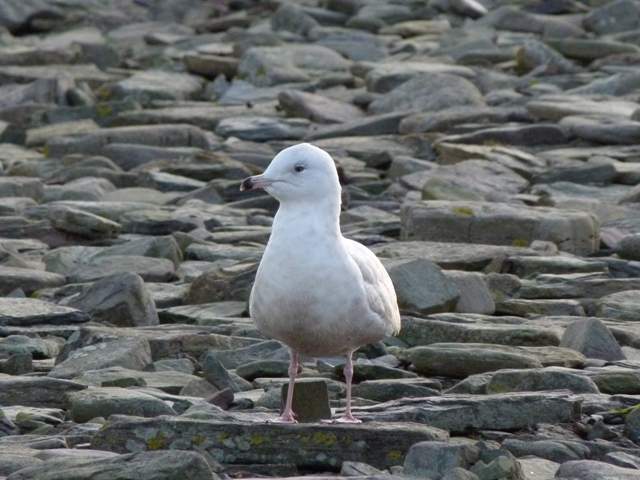 The 2 Glaucous Gulls remained in the Gretchen area all day and an immature Iceland Gull was seen briefly off the pier, while another was found recently dead along the west coast-the third individual known to have perished on the Island in recent weeks. With a switch in the wind to a strengthening south-easterly there was a decent movement of Little Auks passing by the north end, with 114 counted moving west during an hour long sea-watch in the morning. 52 Kittiwakes also passed west and 3 Red-throated Divers flew east. There were now 2 immature Glaucous Gulls feeding on the seal carcass near Gretchen and 18 Snow Buntings were in the same area. 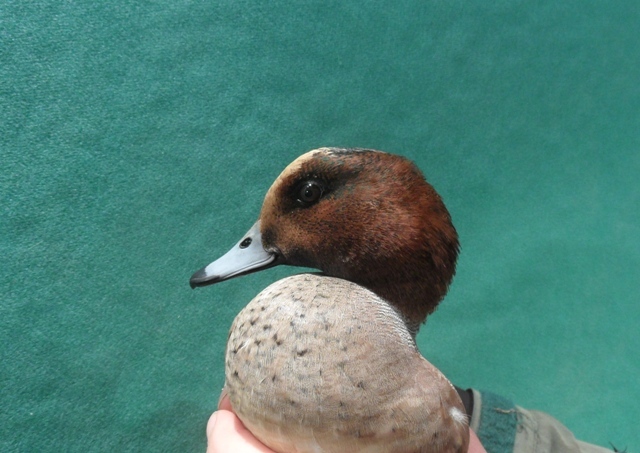 2 Woodcocks were flushed during the day and notable wildfowl included 5 Gadwalls, 3 Pintails and 15 Goldeneyes. 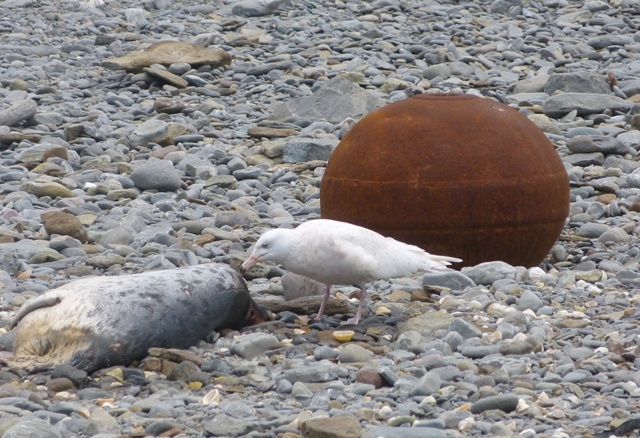 ﻿This Glaucous Gull has been closely guarding a seal at Gretchen for over a week, but today it allowed a second bird to join it and share the spoils. The usual 2nd winter Glaucous Gull was seen in the south of the Island on both dates, but otherwise the only significant sighting on 27th was the first Water Rail of the year at Bridesness Loch. On 28th a 2nd winter Iceland Gull (also likely a lingering bird) was on the Links, 60 European White-fronted Geese counted near the School and the Scaup reappeared on Ancum. A juvenile male Hen Harrier was at least the fourth individual seen this week, and two Merlins and a Peregrine were around Twingness. After yesterdays gales it wasn't surprising to find large numbers of birds feeding on the storm driven seaweed on the east coast of the Island. Bridesness in particular was a busy place, with hundreds of Gulls, Wildfowl and Waders making the most of the newly available food. 4 Iceland Gulls (3 adults and a 2nd winter) were seen and at least 2 immature Glaucous Gulls roamed the coastline. The 6 Tundra Bean Geese reappeared again, and at least 43 European White-fronted Geese were counted. A Pochard was on Ancum, and there were 26 Tufted Ducks and 12 Goldeneyes on various Lochs. 15 Rock Pipits were at Bridesness, a single Linnet in the north and Twite at the Observatory increased yet again to 48 birds. 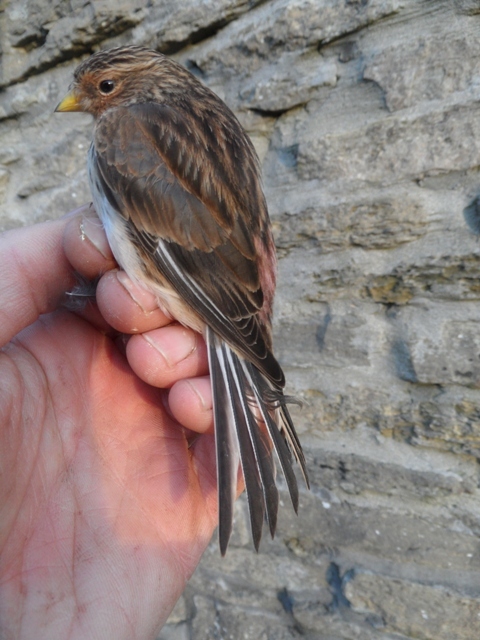 Of the 22 Twite trapped today, 5 were colour ringed birds. Two colour combinations were noted-The first on left leg ORANGE over LIGHT BLUE and on right leg WHITE over BTO metal ring (as in the bird above), the second similar combination was on left leg LIGHT BLUE over ORANGE and on right leg WHITE over BTO metal ring. Any details as to the origins of these birds would be welcome. Sightings on 24th were much the same as recent days with the 2nd winter Iceland Gull still near the lighthouse and the 2nd winter Glaucous Gull still at the south end. 2 Peregrines were seen together and a ringtail Hen Harrier was seen again. In strong southerly winds on 25th there were many more Gulls at the north end with a mixed flock of c300 Herring Gulls and Great-black backed Gulls joined by a 1st winter Glaucous Gull there. 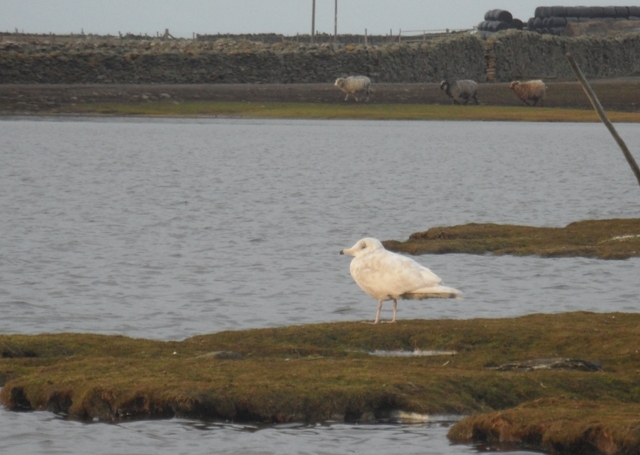 Two Iceland Gulls were seen in Nouster Bay, a 2nd winter and an adult which at a distance appeared to show features of Kumlien's Gull, but disappeared towards Stromness Point before it could be confirmed. A Woodcock was near the Observatory and 40 Twite were still around. This Wigeon was the highlight of a late night dazzling﻿ session, it was just the 10th to have been ringed on North Ronaldsay and the first since 2000. More routine fare trapped and ringed were plenty of Turnstones, Purple Sandpipers and singles of Lapwing, Ringed Plover, Oystercatcher and Snipe. There were few sightings on 22nd with 4 Pintail and the Scaup noted on Ancum, while the Twite flock at the Observatory had increased further to 32 birds. The 23rd saw a new addition to the year list in the shape of a Little Auk which flew past the Beacon. 12 Kittiwakes also passed there, and there were 9 Red-throated Divers and 3 Great Northern Divers on the sea off the north end. The 5 Whooper Swans were still on Garso, along with 2 Pintail and a single Shelduck was on Gretchen. A 2nd winter Glaucous Gull was still feeding on the seal carcass in the same area, while a 2nd winter Iceland Gull near the Lighthouse preferred to feed on a freshly deceased Shag! 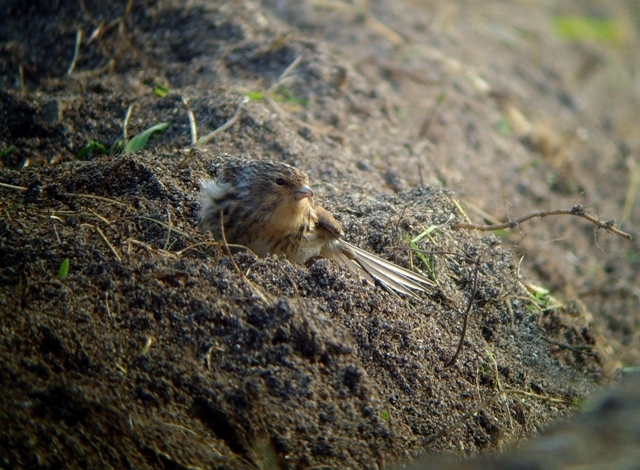 The Twite flock at the Observatory contained roughly 25 birds and 16 Snow Buntings were around Bewan. Todays sightings were very limited given the weather, with notable sightings in keeping with recent posts, as 3 immature Glaucous Gulls were feeding on various dead things around the island. A much more pleasant day, with long periods of sunshine. 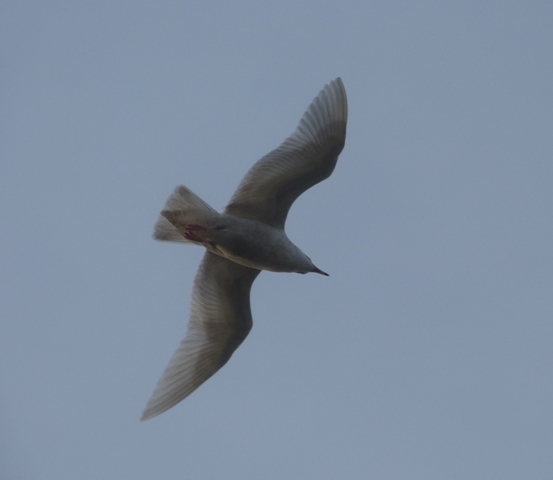 Just two Iceland Gulls (1st winter and 2nd winter) were seen, but both were brief flybys. Much more obliging was a 2nd winter Glaucous Gull which spent the day feeding on a seal carcass near Gretchen. 58 European White-fronted Geese were again near the School and the ever present Scaup was on Ancum. The adult male Peregrine was seen again, along with singles of Merlin and Hen Harrier. Notable passerines included a Song Thrush and 19 Redwing in Holland Gardens, 3 Reed Buntings and the Twite flock in the Observatory crop had increased to 27 birds. A few more birds were recorded today with 4 Iceland Gulls seen (adult, 3rd winter and 2 2nd winters), plus an adult was picked up freshly dead at Garso. 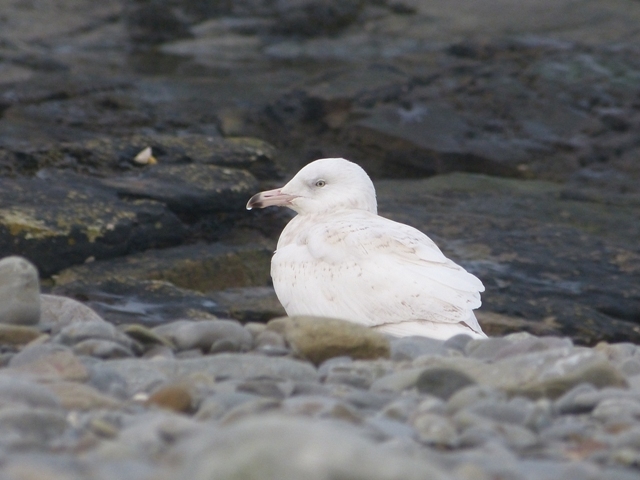 There were also 2 Glaucous Gulls with a 1st winter near the Lighthouse and a 2nd winter at Bridesness. The 5 Whooper Swans remained on Garso Loch and 37 European White-fronted Geese were between the school and Hooking. Other wildfowl of note were a single Shelduck, 2 Pintails, 15 Shovelers, 33 Tufted Ducks and the Scaup. The first significant count of Sanderling this year saw 74 on the Golf course, the wintering Grey Plover was also there and a Woodcock was flushed from Stromness Point. The Chaffinch was seen again, 16 Twite were in the Observatory crop and 32 Snow Buntings were at the north end. 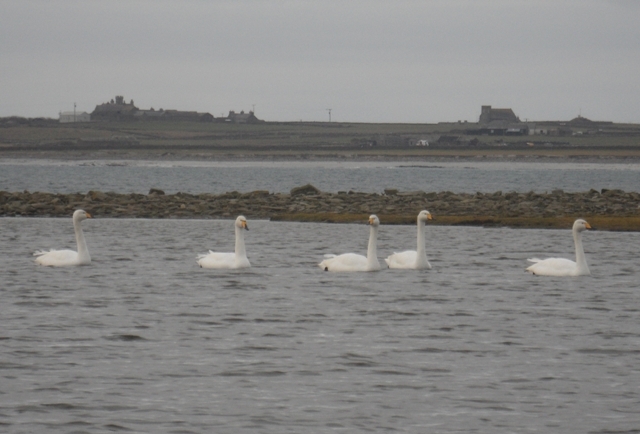 ﻿Whooper Swans winter annually on North Ronaldsay, however Bewick's Swan has amazingly yet to be recorded so with 2 birds on mainland Orkney last week we'll be checking the Lochs fairly regularly over the winter months. A return to the more expected wet and windy weather resulted in not much being seen. 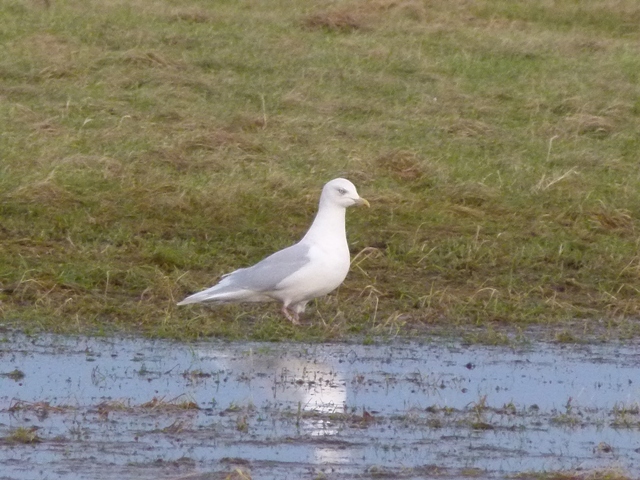 An adult Iceland Gull was still on the Airfield, and a presumed different adult was at Bridesness. The Scaup was still on Ancum and just a handful of thrushes were seen. A male Chaffinch was the first of the year and an unexpected passerine highlight. Otherwise it was white-winged Gulls which dominated once again with 4 Iceland Gulls (2 adults and 2 immatures), plus a 2nd winter bird unfortunately found dead and at least 1 Glaucous Gull (1st winter) was seen at various sites during the day. 1229 Greylag Geese was a high winter count for the Island but just 23 European White-fronted Geese were with them today. The Scaup remained on Ancum Loch and 202 Teal were counted, most of which were on Bridesness along with 18 Shovelers and 3 Pintails. 38 Dunlins were on the beach at Nouster along with 60 Ringed Plovers, and 2 ring-tail Hen Harriers, a female Merlin and the immature male Peregrine were all noted again. ﻿With several days of calm, fine weather we've even been tempted to put the mist-nets back up in the Holland House gardens to try and catch some of the 30 or so Redwings wintering there. 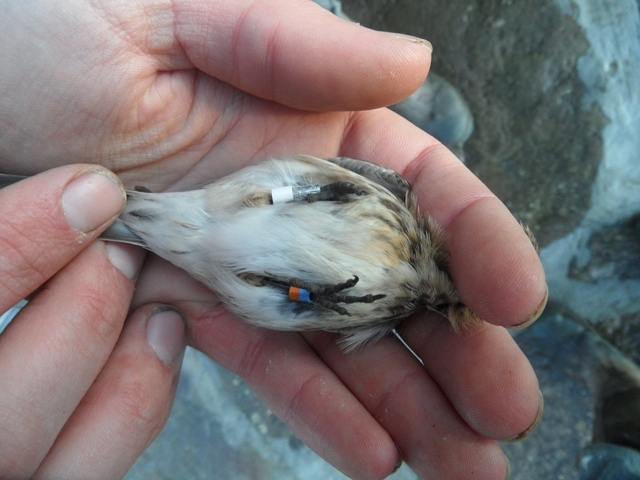 All those which have so far been trapped and ringed have been of the slightly larger, darker Icelandic race 'coburni'. A Long-eared Owl was flushed from Holland Gardens during the morning, with the rest of the day involving repairs to winter damaged stone dykes. Casual sightings however produced both Iceland and Glaucous Gulls,and 10 Twite and 3 Skylark were in the Obs crop fields and 61 European White-fronted Geese near Hooking was close to the record count of 65 set in 2011. Coverage was less extensive today and as a result just 4 Iceland Gulls (2 adults, a 2nd winter and a 1st winter) were seen. 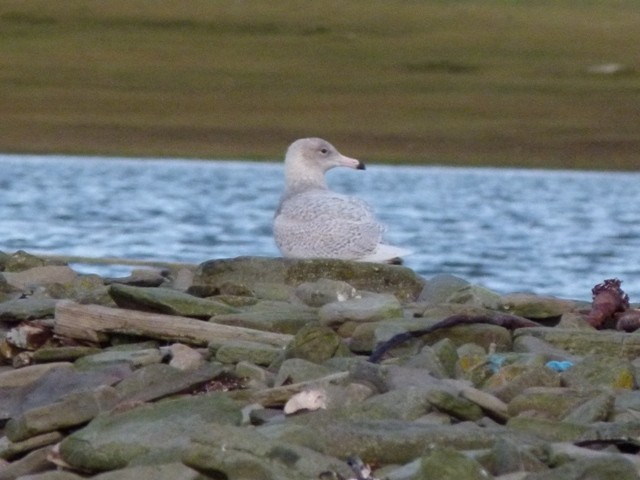 There were however 2 new Glaucous Gulls with a 2nd winter on the Links and a 1st winter on Bewan Loch both different individuals from those seen on 13th. Notable wildfowl included the first Pochard of the year joining the Scaup on Ancum, 13 Goldeneyes and 8 Gadwall on Bewan, 32 Tufted Ducks and 3 Shelducks. 35 European White-fronted Geese were at Hooking and the 6 Tundra Bean Geese were seen again at Westness. An adult male Peregrine near the Lighthouse was different from yestedays bird and there were 4 Great Northern Divers on the sea off the north end. 3 Robins, 2 new Song Thrushes, 4 Fieldfares, 26 Redwings and 34 Twite were the only passerines. A cracking winters day gave us the chance to get around most of the Island and some notable counts were made. A minimum of 9 Iceland Gulls (3 adults, 2 2nd winters and 4 1st winters) were present and 460 Common Gulls were counted feeding in the bays so there is clearly plenty of food on offer for Gulls at the moment. None of the Iceland Gulls seen in recent days have been 1st winters so there are clearly new birds arriving and moving through daily. Also of note were 58 European White-fronted Geese near Hooking and there were 5 Whooper Swans on Garso Loch. Other wildfowl counts were 248 Wigeon, 132 Teal, 88 Mallards, 9 Tufted Ducks, a female Scaup on Ancum, 13 Red-breasted Mergansers and 5 Goldeneyes. Raptors were well represented with at least 3 Hen Harriers, an immature male Peregrine and a Merlin making the most of the fine weather. There were also more passerines around than expected with 18 Skylarks, 12 Fieldfares, 32 Redwings, a Song Thrush, 23 Twites, 2 Linnets and 96 Snow Buntings seen. Apologies for the lack of any sightings recently, ornithological staff have been away from the Island for the last month and have only just returned. With fine weather forecast for the weekend we'll be having a thorough thrash around the Island to see whats about and will be updating the sightings page regularly again. Casual sightings over the last couple of days include 6 Tundra Bean Geese and 20 European White-fronted Geese with the Greylags, and in-line with the current influx into the Northern Isles up to 7 Iceland Gulls have been present along with 2 Glaucous Gulls. We are also currently experiencing technical difficulties with the website and have thus far been unable to update our prices for 2012 so please call 01857 633200 or contact alison@nrbo.prestel.co.uk for details and booking enquiries.